Larabee still has all of those costumes in a display case in his basement. You think I’m kidding, but I’m not. He is absurdly proud of those things even though they are the most unbelievably hideous creations known to man—even before you realize that they’re made of spandex. That just makes it ten times worse. One of these days, I would find a way to destroy that fire resistant case and burn them all. For now, though, I have to pretend that they don’t exist. I do my best to block out the memories. I think if I thought about them too much, I’d end up blind. Or insane. Or both. It took a while to get Larabee past the horror show that was the costumes he’d created. I’m skipping over a lot of the details—not just of the costumes that make my brain want to explode—but over the monotony of the days waiting for the discovery of this miracle fabric that would end the torment of a random form shift—believe me, I’d started acquiring some clothes for other ages, but it wasn’t like I could carry them with me all the time. I really needed something that I could wear whenever. Something that was not spandex. “I am so done,” Clayton muttered, getting up. He took a deep breath and shifted himself back into his normal form, readjusting his clothes. His suit fit fine again, and he may as well get back to work now. There was no point in doing this. Larabee wasn’t going to come up with anything. Nothing was going to change. Clay was stuck without clothes that would adapt. He’d just have to get one of those vacuum pack bags and carry an entire wardrobe with him. That was what he’d have to do. There was no other option. He sighed. “I’m sick of your ideas. 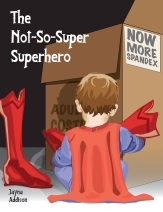 They’re all costumes and spandex, and I don’t need the first and won’t wear the second,” Clay called over his shoulder as he headed toward the door. Clayton looked at the vat, and then his natural sense of preservation kicked in. He ran for the door again. He wasn’t feeling like dying today in whatever experiment Larabee might have created. He yanked on the door handle and tried to open it even as the container exploded, its contents coating the room in a disgusting smelling slime. Larabee must have been somewhere else under the wreckage, possibly unconscious. Clay sighed and started back for the other man. He picked up a twisted piece of metal and pushed it to the side, checking Larabee’s vitals. Okay, so the man was alive. And not covered in this crap. That was completely unfair. And then Clay felt the twinge in his fingers and knew that it could get worse.